My apologies for not posting earlier but I've been inundated with work and when the bills need paying, turning work away is not a good idea. It's pretty, isn't it? It's the tattoo you're meant to be looking at, not the leg that looks like a plucked chicken. It isn't that blurred in real life, it's just that my camera doesn't like close-ups too much and trying to hold it and twist my ankle in order to get a picture was a nightmare! I have to admit that I did consider calling to say I wasn't coming but figured if other people were brave enough to have it done then so would I be. And quite honestly, those of you who said it hurts were either winding me up or you're a bunch of whuzzes. Uncomfortable? Yes. Sore? Yes. Painful? No, not really. My idea of pain is far worse than the sensation caused by a tattoo needle and if I had to describe it, I'd say it was more like being scratched by a pin than anything else. Richard asked if it was maybe like being touched on a burn but no, not that bad. Scratched, that's all. In fact, I was so relieved that it wasn't worse than I'm now considering going back to have the spider put on my shoulder! Not just yet, though. As for writing, nothing much has happened. No, that's not strictly true because I've spent quite a bit of time working out some plot changes that I need and which haven't come easy. I think I'm there now though and can get on with the actual writing. If there's one thing that's certain, writing consists of far more than just putting words on paper. It's for that reason that I don't really understand those who can have "word competitions" because... well... does it really matter how many words you've written on any given day? One person may have written 3,000 words while the other spent her time researching or working on the plot. Oh well, each to their own and if it helps them get on with their work then it can't be a bad thing. My daughter and I went to town after the tattoo was finished and I was very good. We went in Ottaker's to buy her a book but I didn't buy any for myself. I have to admit that I almost did but she reminded me of the fifty that are on the "waiting to be read" shelf and steered me away from the Val McDermid I'd dipped into. PS: Just noticed that Ally Blake has written something about the word competition she has with Natasha Oakley. It's a response to a comment I made on her blog and is quite interesting. It certainly proves that what works for one doesn't necessarily work for another. As for word counts I've expressed my feelings before re them not being the only (or necessarily the best) way to measure productivity. Think it was James Joyce who once said something along the lines of 'Today was a good day. I wrote 2 words. Though I'm not yet sure what order they go in!. 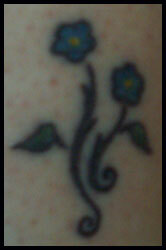 Research (local, amongst body painted friends that is)shows that one tattoo always leads to thoughts of another. Enjoy this one before thinking about becoming the next Tattooed Lady and running away with the circus!! Debi. You're right there, it could be dangerous. I'd hate to turn into an eternal pessimist just so's I wouldn't be surprised if something bad happened. What a life! The decider for me was really the fact that I had a Broviac line put in with only local anaesthetic. It was pretty painless the first time but the second time it was quite nasty because the anaesthetic didn't work on the original scar tissue. I figured if I could put up with that (having a hole made in my chest and a long plastic tube threaded down a vein), how bad could a tattoo be? Loved the James Joyce quote! Minx. The circus? Now there's an idea for a story! I'm sure the spider will appear one day but not yet. Because of circulation problems, things take ages to heal on me so I'll probably still be hiding my ankle from the sun come October! No brown legs for me this year! As I want the spider on my shoulder, having it done in autumn would mean it'd have a chance to heal before thoughts of strappy tops returned. Mind you, things could be worse: I could get my lip pierced! Nice tattoo, Sharon! Glad to hear it didn't hurt. I've known plenty of people who once they get one tattoo, they get another and another and another...very addictive. As for word count, I think we have to take a broad view...say over a week or even two. Yesterday all I managed was a bit of research and some notes in preparation for next week's chapter; still, I'm pleased enough with the week's overall word count. Karen. Richard was very supportive of the tattoo being done, even though he's not 'into' tattoos, as such. He's really not the type to tell me what I can and can't do, but then I think he knows I'm a stubborn mare - the more somebody tells me I shouldn't do something, the more likely I am to do it. Not always good for me! Eva. Yes, the broad view sounds good to me. Few words on paper but lots of thinking, that's me this week. I'll blog about that when I get back from Leicester. I so agree with you that a lot of writing takes place off the page! Word counts can be a motivator though, when the mind goes blank. Don't know if you have come across Tha Artists Way, but Julia Cameron recommends writing without stopping to think, as a way of cutting through the cr*p that can get in the way - three pages, or several hundred words, the main thing is to keep on writing and/or thinking! Personally, I would welcome the cessation of all thought for - oooh - one minute would be nice. Please do notnvmu suggest meditation. Cherry. When I'm actually putting words on the page, I very rarely stop to think. It's the only way I can really get things flowing. Once I've finished, I'll then go back and re-write/edit until I think it makes sense.